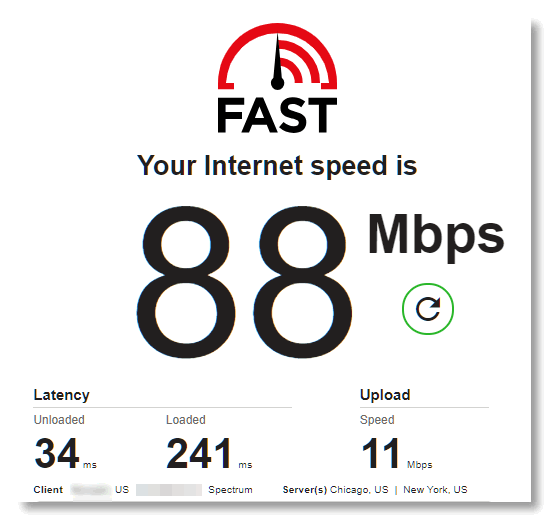 There are many reliable (or fairly reliable) ways to check your Internet connection speed. Probably dozens of them. The easiest way is to type Speedtest in the address bar of Chrome or Firefox and press Enter. You’ll see some information and a “Run Speed Test” button. Now, my ISP told me recently that this particular test is not very accurate, but I think that’s because it didn’t say what he wanted it to say. He recommend Ocala Speed Test at https://speedtest.net/ . But that site has added so many ads and extraneous stuff, it’s getting awfully cluttered. The next time you want to check your Internet speed quickly and accurately, without any clutter, you won’t find any cleaner, quicker way than by visiting Fast.com. What can I say? I can certainly read that. While that’s only my download speed, it’s what most of us want to see when we want to know how fast our connection is. But, if you want to see more details like your upload speed, no problem. Just click “Show more info”. A Megabit is 1/8 as big as a Megabyte. This means that to download a 1 MB file in 1 second you would need a download speed of 8 Mbps. 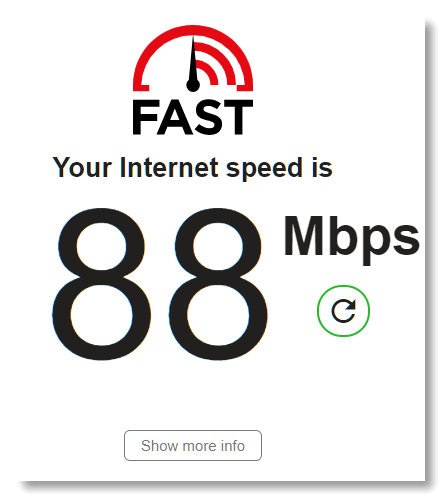 Mbps means megabits per second – not megabytes per second. But let’s not get all caught up in this stuff. Today’s site pick is FAST – and you can get there FAST by clicking this link. Tried Fast speed test, then tried speedtest.net and there was a 7 to 8 Mb difference on the low side from Fast. I don’t know where Fast is connecting to but speedtest connects to the closest server from your location which would be San Francisco in my case. Fast doesn’t display the server location it connects to. Not good. The closer to the server the more reliable are the results. At the speed of light distance to the server is not that important -186,000 miles per second. The number of hops to the server is important. Latency is important. Most users can check their speed 5 times and get 5 different results – no one’s connection is static -it’s constantly changing. Just because Speedtest.net shows the server does not mean it’s more accurate. But use what you like and believe what you want. Fast.com is just a fast easy way to check speed. And I know Netflix knows how to check speed. Holy Catsinjammers! That is a good tool. Still fighting with my provider. They blame my computer, my hardware and pretty soon, I think they’ll blame my mother! Running at about 35, which is up from 1.4 anyway.